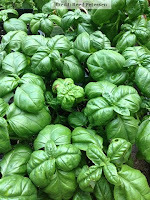 How to Grow Basil, our featured herb of the week. Let's talk Basil. Now that the Minnesota weather has warmed a bit the basil will start to thrive in the garden. It is not at all late to plant basil, I won't plant our crop in the field for a week or so yet. Usually after fathers day when the soil is toasty warm and the weather starts to stabilize. Those super long June days around the summer solstice are just what the doctor ordered for Basil. Basil is in the mint family, but unlike mint, it hates cold. If the temperatures even hint at 40°F, cover your basil or you may have cold damage. 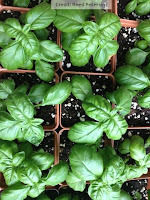 We are also still planting basil in flats for late spring and early summer needs. We sell it all summer at our market stand. When planting in the garden or field, you can plant the transplant a little below the surface where the plant was growing. Add a handful of organic fertilizer to the hole and mix in well with the soil or compost. Fish emulsion works well as a starter fertilizer, but be careful you don't get any on the leaves you were planning to harvest. If you are getting transplants from us, they are very well hardened off and have typically been out in the sun, wind and rain for several weeks. If you buy a plant from the local garden center or green house protect it from wind and direct sun for a couple of days. We try to have our plants at the size where you can start harvesting right away when you get home. Let the plants size up a bit before harvesting too much. This establishes the frame or scaffold of the plant. When you pinch off the tip of the growing plant the stems will branch and branch and branch until they are very full and productive. If you see a blossom starting pinch it off. If the plant blooms it thinks it has fulfilled its mission and it will stop producing. There is nothing better than the fragrant smell of basil. 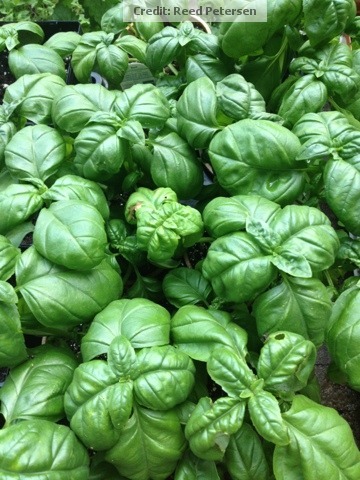 During full season we will bring 2-3 bushel of basil to market a week and sell it for the price of spinach. What a deal! I'll post some recipes to give you some ideas.